Don’t forget that Nephi built a temple in the Americas. Good catch on the Elephantine Island temple, but I don’t see the one at Arad. Floyd, good one. I’ll have to see if I can find the New World temples approx. dates, and add them in. Larry, do you have dates on the Arad temple? FAIR says it is from the 10th century BC to 1st century AD. I’ve made several updates to the timeline. I’m still looking for details about the following temples to add: Mizpah, Hebron, Bethlehem, Nob, Ephraim, Ophrah, Gibeah, and Shechem/Mt. Gerizim (Samaritan). This timeline is awesome, Bryce! 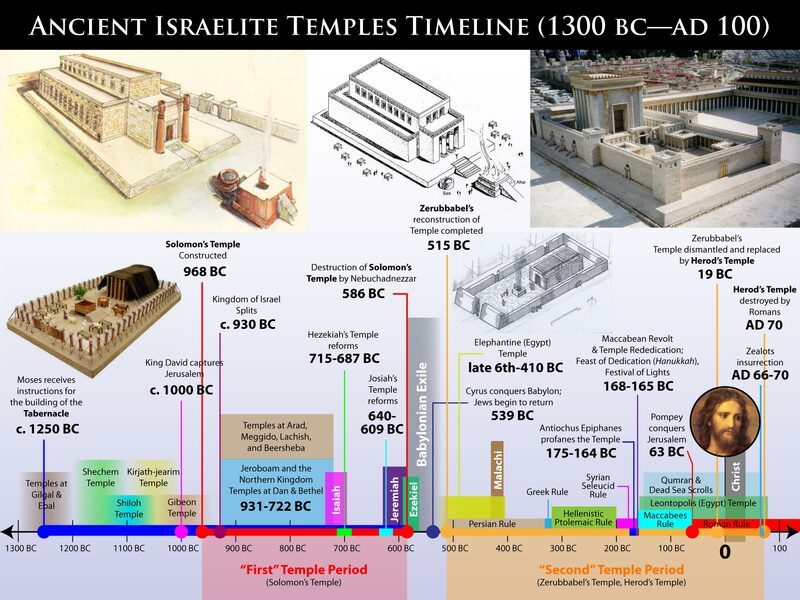 And especially so now that you added all the other temples — I have never seen them all depicted on any timeline before. Very nice images and professional look! Thanks a bunch! Thanks David. Let me know if you see anything I may have left out or got wrong. I want to keep it updated and current. I may even expand it beyond AD 100. I’m still looking for more details about these temples: Mizpah, Hebron, Bethlehem, Nob, Ephraim, Ophrah, Gibeah, and Shechem/Mt. Gerizim (Samaritan). They are mentioned in the Solomon’s Temple book. Very well done, Bryce. Just one more great tool to help people in their personal understanding of the temples of the Lord. This continues to be one of my favorite sites on the web! I never miss any post you publish, thank you so very much for all the time and effort you devote to helping people all around the world appreciate the House of the Lord. You’re very kind, Steve. Thank you. I’ve updated the timeline again. On the suggestion of a friend, I’ve decided to make this strictly an Old World temples timeline, so I’ve removed the few references to temples in the New World. I may make a separate timeline which compiles what we know of temples in the Book of Mormon. I’ve added some details about the ruling parties in Judea between 515 BC and AD 100. I’ve also added a visual reconstruction of what the Elephantine Temple may have looked like. Other small details have also been added. Wow, this looks great! Very professional looking and very informative. I’ve never seen a temple history laid out so well. What software did you use to make it? You mentioned you had created a separate timeline for the New World, but I couldn’t see a link to it. Have you put it up? I would love to see a continued history after 100A.D. Thanks Brandon! I used Adobe Illustrator to design it. I’m a designer by profession. I haven’t made a timeline yet for the New World. The biggest difficulty is that there are not many details about the temples in the New World. We only know about 3-4 of them, and most we don’t have details of their construction (dates in particular). So it may be hard for me to make one for the New World.